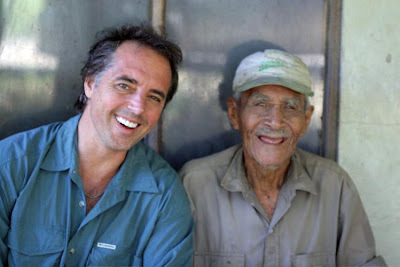 Dan Buettner with 100-year-old Felipe Gudoy, in Costa Rica's Nicoya penninsula. Aging only has an accelerator pedal, Dan Buettner says -- there is no brake. So the key to living longer is simple: Don't step on the gas. But how do you do that? For a clue, the Minneapolis author and explorer traveled the world to find so-called Blue Zones, places where the people live much longer and in greater number than is the norm. He and a team of researchers then studied those people to find common links that might translate into a longer life for anyone. The result is Buettner's new book, "The Blue Zone: Lessons for Living Longer From the People Who've Lived the Longest" (National Geographic, $26). In three years of research, Buettner found four Blue Zones, places where people have up to a three times better chance of living to 100 than we do: Okinawa in Japan, a mountainous region in Sardinia in Italy, the Nicoya Peninsula in Costa Rica, and Loma Linda, Calif. He joined with the National Institute on Aging to come up with a methodology to understand each region's culture of longevity and then backed it up with epidemiology studies. "It's not just Dan Buettner's observations," he said. Dr. Greg Plotnikoff, director of the Institute for Health and Healing at Abbott Northwestern Hospital in Minneapolis, joined Buettner in Okinawa to vet the author's field work there. He praised Buettner's big-picture approach to studying the centenarians. "It's not just 'What did you have for breakfast Mrs. Jones?' It's the whole context," Plotnikoff said. "This is why I'm such a big supporter of Dan's work. He's starting from a different perspective." The gist of Buettner's findings, which he will discuss Wednesday during a sold-out book-launch presentation at Minneapolis Central Library and Friday at the SweatShop Health Club in St. Paul, should be good news to most people. "Typically, when Americans think, 'I want to live longer or stay younger,' they jump to supplements or to diets or to exercise programs," Buettner said. "But the biggest 'Aha!' for us was that the things that truly give you extra quality years and make you look and feel younger now are easy and don't cost anything." Dr. Steven Miles, a geriatrician and a professor of medicine and bioethics at the University of Minnesota, said he generally agrees with the tips derived from Buettner's findings. "On the other hand, you really don't need to go and look at exotic subcultures to derive these rules," Miles said. "They can be derived relatively easily right here at home." That means gardening, walking with friends, playing with the kids and other everyday activities. "The type of physical activity you enjoy is probably much better for you in the long run than anything else you can do, such as running marathons or triathlons or pumping iron," Buettner said. Also consider changes that force spontaneous exercise, such as getting rid of the TV remote control so you have to get up whenever you want to change the channel or using a shovel instead of a snowblower. 2. Hang out with the right people. If you spend your time with people who eat fast food and don't exercise, you're likely to pick up the same habits. "This has a huge, profound impact on your lifestyle," Buettner said. He cited the extensive Framingham Heart Study, which found that obesity can be "socially contagious." Before each meal, elders in Okinawa recite an adage to remind themselves to stop eating before they're full. You can do that more easily by replacing your 12-inch dinner plates with smaller ones. "Every single meal, you'll cut 20 to 30 percent of the calories," Buettner explained, "because a big cue for telling us whether or not we're full is, is our plate empty?" He added that University of Minnesota research suggests that people who eat a big breakfast tend to eat fewer calories throughout the day than people who skimp on their morning meal. The easiest way to do this, Buettner said, is to stop buying meat at the grocery store. That will cut meat from your daily life but still allow you to eat it on special occasions or when you dine with your family and friends. "The longest-lived people in the world eat meat less than four times a month," he said. "I think not eating meat adds an easy half a dozen years to your life." Two ways to do so are reconnecting with your religion and volunteering. "As your job wanes down and your kids grow up, that's when it's hugely important to have a sense of purpose," Buettner said. He's working on a new project about happiness and said he has found that 80 percent of the things that optimize your lifestyle also make you happier. "By just putting a little more energy in the right areas of our life, it will have a huge payoff," he said. "The power is in the repetitiveness, in doing it for a long time and making it your lifestyle. The key is to change your environment -- your social environment, your work environment -- because that will last. A diet won't. An exercise program won't." Here's to a long life. If the link is still active, I highly recommend following it for the captioned photo gallery; among the pictures are a 99-year old man waterskiing (his secret, it says, is his physical activity, eating small portions of good food, and that his weight is the same as it was when he enlisted in the service for WWII) and a centenarian woman who starts every morning by walking a mile through the halls of her building, then goes to the gym to cycle for 6-8 miles, and finishes off with weight training. If those pictures don't inspire you, you're doomed! The Okinawan adage they recite before eating is a concept known as "harahachibu," or eating only until one feels 80% full. My mother always struggles to remember that one ("hairy hotsy boo-boo? ").